Let me share with you my somewhat unusual perspective on the concept of chivalry. There was a time when history was strictly a thing of the past. 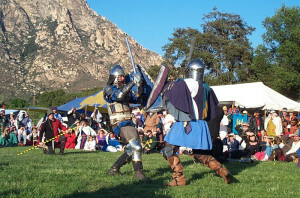 If you wanted to know about the Middle Ages, knights in shining armor or the code of chivalry, you went to the library, toured a museum or enrolled in a college course. Then, during the 1960s and ’70s, a different approach came into play. In this era of social and political reform, a few teachers and their students began to feel unsatisfied with the “traditional methods” of scholarship. They wanted to take all of that historical information that was sequestered in libraries, schools and museums and bring it outside, into the sunlight. So, some of these crazy medieval scholars made themselves suits of armor and wooden swords, and began holding jousting tournaments like they’d read about in their history books. Like any method of research, living history does have limitations. Some scholars initially discounted it altogether — and it’s not hard to see why. Early attempts at re-enacting medieval history were pretty feeble, but those scholarly innovators didn’t give up. Before long it became clear that the people wearing armor and medieval clothing did, in fact, have something to contribute to the field of historical investigation. Although far from a “mainstream” method of research today, historical re-enactment is gaining a certain acceptance among serious scholars. Perhaps the most recognizable indication of this was the publication of the novel Timeline by Michael Crichton, a best selling author known for bringing cutting-edge scientific theory to the public eye. In this book, Crichton delves into the world of “experimental historians” — those who study the Middle Ages through experience as well as research. According to Crichton, these non-traditional academic methods have changed our understanding of the medieval period dramatically in the last fifty years… An age that was once thought to be static, brutal and benighted is now understood as dynamic and swiftly changing. Of course, Crichton’s novel about time-travel to the Middle Ages is hardly an academic journal, but it’s worth noting that killer viruses, cloning and neural implants were the stuff of science fiction when his books The Andromeda Strain, Jurassic Park, and The Terminal Man were published. Which brings us back to that unusual perspective of chivalry I mentioned earlier. I don’t have a PhD in medieval literature, I don’t speak much Latin or Middle English, and I haven’t dug for buried artifacts in dilapidated castles on the Rhine River valley. 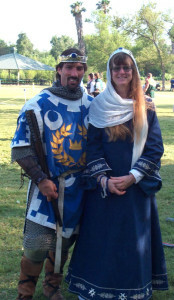 I have, however, been an active member of one of the world’s largest medieval living history organizations (The Society for Creative Anachronism) for nearly twenty-five years, and I’ve spent a fair amount of time inside a suit of armor. Does this qualify me to discuss the concept of chivalry today? I’d like to think so. What I’ve learned in this group is that living history is a two-way street. On one side, it allows us to take a look at history “on the ground” — the way it was seen by the average person — rather than from the bird’s eye perspective of a textbook. On the other side, it enables us to carry the best aspects of history back into the modern world — and the code of chivalry is one of those things. To someone who knows about chivalry only through lectures and literature, it may look like a dead concept; to someone who has struggled with voluntary restrictions of honor and fair play in the final round of a high-stakes championship tournament, chivalry is very much alive. Competitiveness, ambition and greed didn’t die at the end of the Middle Ages, we shouldn’t think the code of chivalry did either. It isn’t hard to see how the lessons of living history — and living chivalry — can be applied to nearly any modern setting, from the board room to the athletic field, from the parking lot at the mall to the dinner table at home. There is one more benefit to be gained from the living history movement: Today, you don’t have to wear a suit of armor, carry a broadsword or joust in a tournament in order to understand and follow the code of chivalry. These re-enactment groups have demonstrated that history is a thing of the present as well as the past, and that virtue and personal ethics should never be relegated to a museum or a library. I hope that, by sharing my quarter-century’s worth of experiences and perspective with you, I can show you how to carry the code of chivalry with you. I hope that after discovering chivalry today you’ll be ready to put it to use in whatever tasks you must undertake as you go about the quest that is daily life in the new millennium. And when you do, I am very confident that chivalry today will serve you well.